it is very difficult to find an art without nature, cause nature is everywhere. Mother nature has inspired us in every way from the beginning especially in art. Viewing its beauty lifts our spirit and ignites up our creativity. Kalam-Kari is result of illumination of creativity and emotion of those artesian who were inspired by mother nature than any other art form inspired by Her. 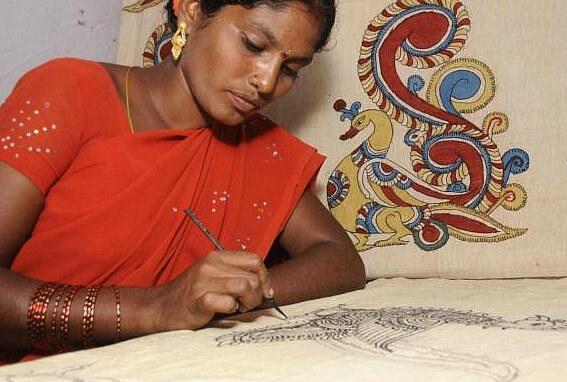 The art is more than a portrait of nature, its a exaggerated adorableness of nature depicted by incredible hands of the artisans. 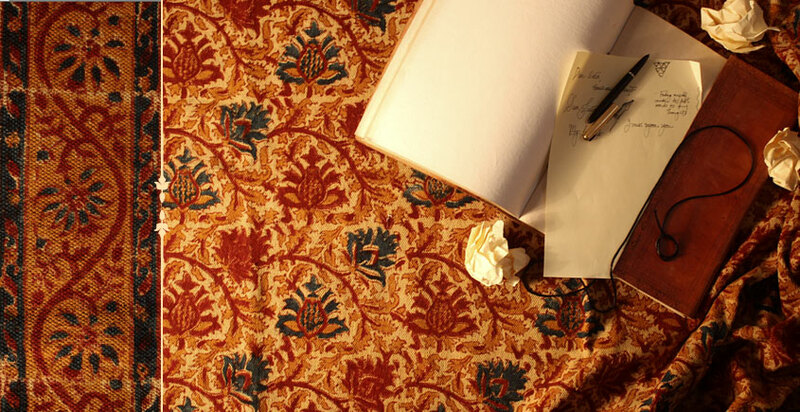 As the name suggest kalamkaari - ‘Kalam’ is the Persian word for pen, and ‘kari’ in Urdu implies the craftsmanship involved. A kalam with pointed tip is made for drawing and painting outlines and the flat nib is used for filling in color. A compact ball of hair or fiber absorbs the liquid dye that is guided by the pointed tip. 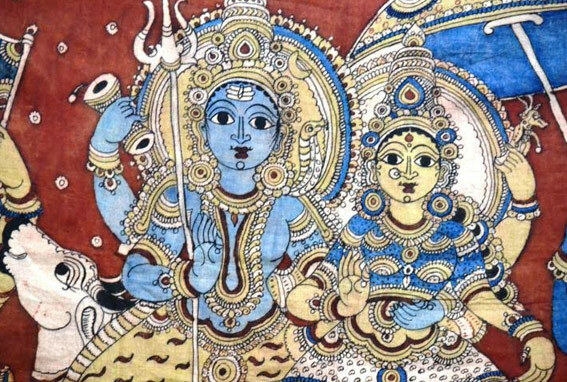 In india history of Printing and resist dyeing is almost 5000 year old, but The origin of kalamkari can be traced to the early period of alliance between the Persian and Indian trade merchants. During this period of king Satavahana(3rd century B.C. 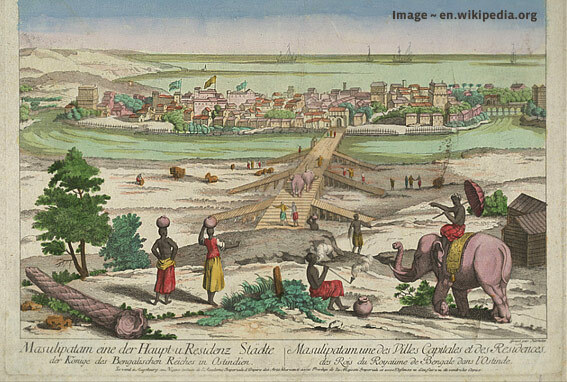 ), the city Machilipatnam was known as Maisolos and Masalia. They used this port as the gateway for their sea trade. As per some scholars, the city came into existence in first century AD when it was famous for Muslin, a thin-plain weave cotton cloth. Perhaps, there was the reason why it was referred to as Masalia or Masulipatnam. 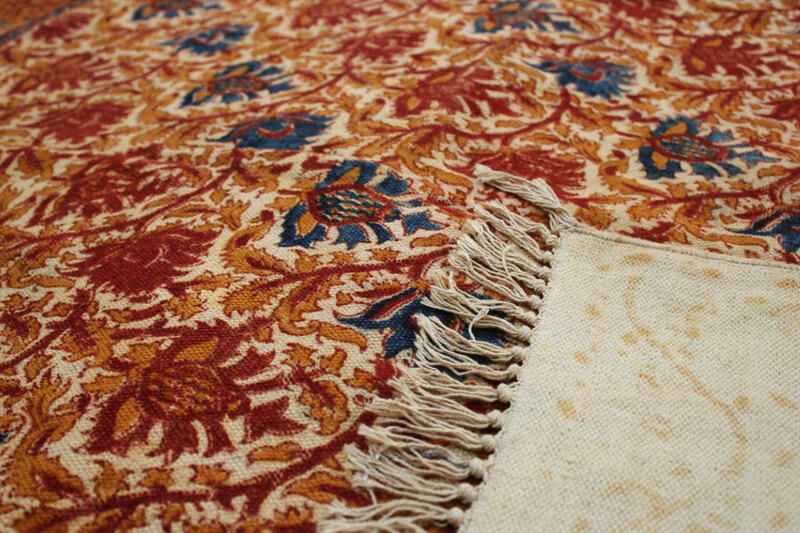 During the British East India Company set foot first on the Coromandal coast and were fascinated by inexpensive, intricately hand printed brightly coloured fabrics. 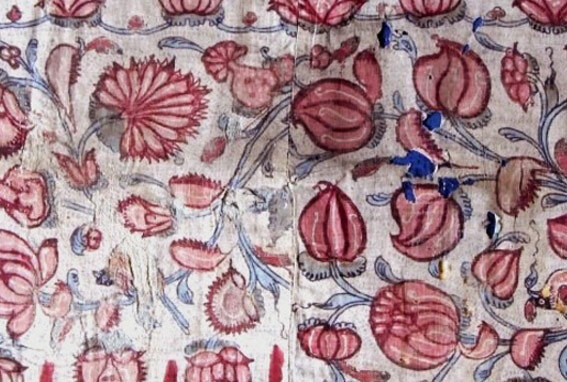 The popularity and subsequent demand of brightly coloured Kalamkari, better known as ‘Chintz’ in europe, actually resulted in decline in the demand for machine printed fabrics, produced locally. 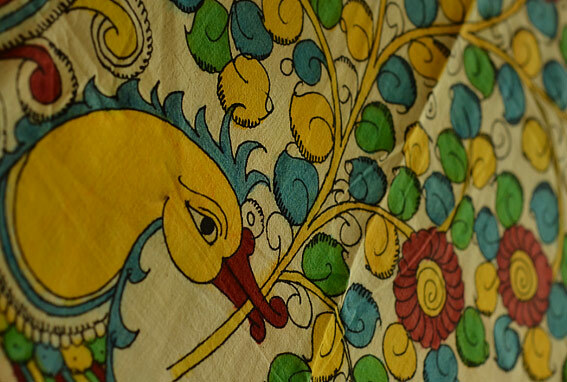 Cotton/muslin fabric used for Kalamkari. for de-starched it first treated with a solution of cow dung and then treated with Harada paste, to prepare it for absorbing the colour. Outlines of the figures are painted first, with black colour prepared from jaggery and iron. After this, red colour, extracted from tamarind seeds is filled in and the areas supposed to be white are left blank. 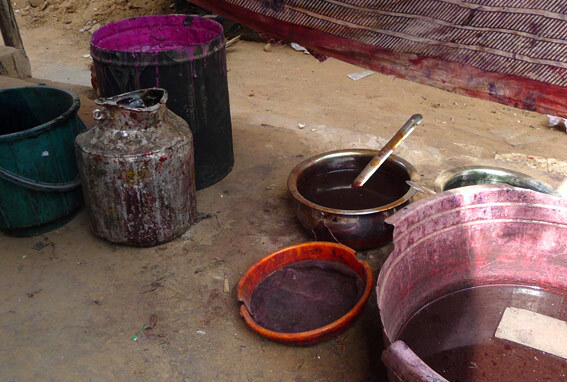 After application of each colour, the fabric is boiled in alizarin solution, After the red color has developed, the cloth is taken out, squeezed and dried in the sun. 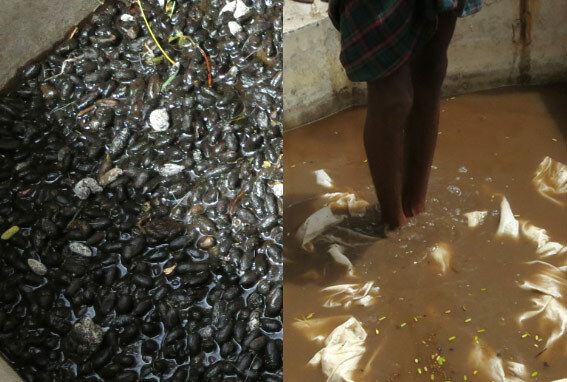 The amount of time for which the cloth is kept in water determines the shade of the cloth. During the process not only the red color develops as a result of the combination of alum and alizerine but the alizerine also contributes to fixing the black color which has emerged at a previous stage. 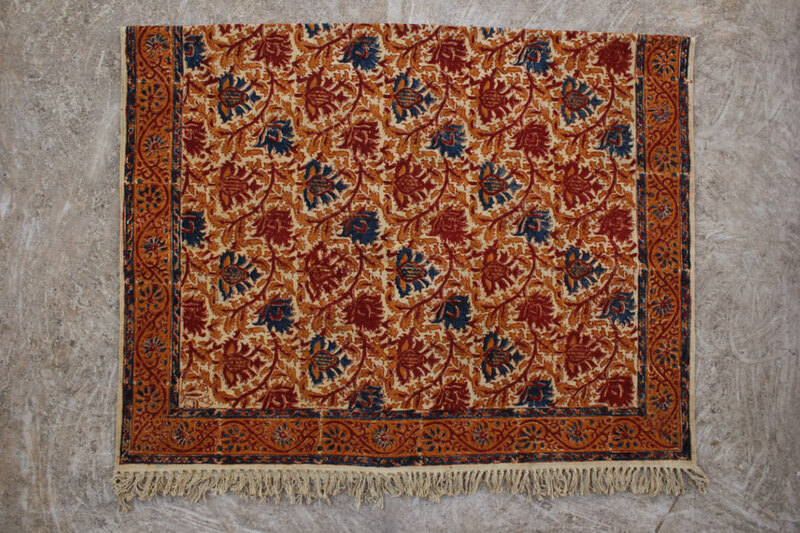 Kalamkari has many styles, masulipatnam style was influenced by Persian designs, while The Kalahasti style developed around the temples with their patronage. As a result it has a distinct religious identity and thrives on mythological themes. Traditional themes are depicted from the epics or Puranas,stories of gods.The entire epic is depicted through several stories and each episode is depicted in horizontal panels,featuring the principal deity or episode.A single icon depicting a deity or deities,is also painted.Blue is associated with deities;red with demons;Hanuman is depicted green; yellow is used for the female body colour and also for gold ornamentation. Animals and geometrical designs are traced in black outline against a white background.Moving away from depicting mythological figures within a canonical style,the artists have used their creative skills both in terms of illustration and color palette in depicting the jataka and Panchatantra panels. Stories from the lives of Buddha and Christ, have been introdued in recent years. it is very difficult to find an art without nature, cause nature is everywhere. Mother nature ha..